In a small skillet over low heat, toast coconut until it's golden brown. Watch it closely as it toasts because it can burn quickly. When toasted (3-4 minutes) remove from heat and let cool. In a medium-sized mixing bowl, mix together cream cheese and yogurt with a hand mixer. When the mixture is smooth and creamy, stir in chocolate chips and cooled, toasted coconut. 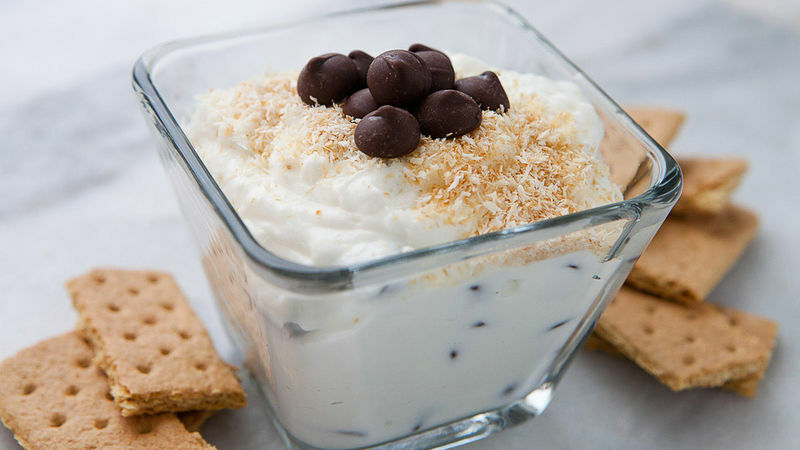 Garnish dip with extra chocolate chips and toasted coconut. Chill dip until ready to serve and serve with graham crackers.